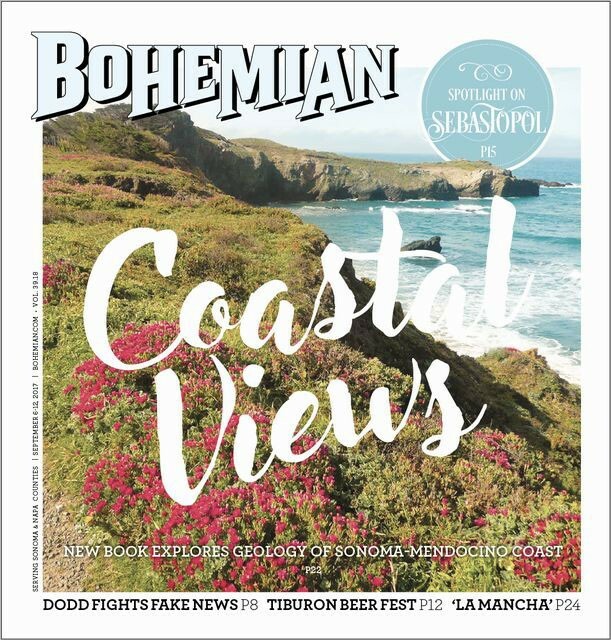 Thomas Cochrane reads from 'Shaping the Sonoma-Mendocino Coast' on Saturday, Sept. 9, at Copperfield's Books (775 Village Court, Santa Rosa; 4pm; Free; 707.578.8938) and lectures on Sunday, Sept. 10, at Sugarloaf Ridge State Park (2605 Adobe Canyon Road, Kenwood; 6pm; $10; 707.833.5712). It may not appear so, but the Sonoma Coast is moving, shaking and eroding into the ocean as two massive pieces of the earth's crust interact along the San Andreas Fault. Geologist Thomas Cochrane has spent 40 years studying the coastline from his home in Sea Ranch. Now he shares his insights in a new book, Shaping the Sonoma-Mendocino Coast: Exploring the Coastal Geology of Northern California. Raised in rural New York, Cochrane spent 25 years working as a petroleum geologist in the flatlands of Oklahoma. He says he stumbled into living in the North Bay after he visited friends and fell in love with the redwood trees and the ocean views. "I wasn't here four hours and I bought a forest lot," he says. Once he settled in Sea Ranch, he took to studying the local geology in earnest. "What I noticed early on is there weren't any detailed geology books on the coast here," he says. Cochrane gathered his knowledge in the field, spending decades looking at rates of erosion and rock composition of the varied and sometimes unusual geographic patterns of the coast. "I was motivated a couple years ago to sit down and put it all together, and to write a book that was accessible to the public rather than just to scientists," Cochrane says. Made up of nine chapters and an appendix that acts as a road log, the new book offers a complete picture of the terrain and explains several of the coasts unusual formations. Viewing the land on a geological time scale, Cochrane explains how the rugged terrain was formed. "Four million years ago, we were under the ocean, and now the area here has risen to 2,500 feet," Cochrane says. "The land is rising." His book explores sea caves, sinkholes and coastal river watersheds. But not even Cochrane can explain everything, such as the bizarre Bowling Ball Beach north of Schooner Gulch in Mendocino County, named for the hundreds of smooth, rounded sandstone boulders that sit along the coast in six straight rows in a manner that almost looks intentional. "Someday we'll figure it all out," he laughs. After dispensing with the scientific information, Cochrane's new book lays out an 80-mile road log extending from Bodega Bay north to the unincorporated town of Elk. The reader is encouraged to day-trip to all the geological attractions, using mile markers to direct travelers to the best views. The book also offers insight into the human impact on the coastline. "I think the value of a book like mine is to give people the knowledge of what's here," he says. "They can use that knowledge to take ownership of and protect the land."